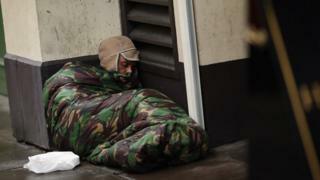 As many as one in 25 people are classed as homeless in the worst-affected areas of England, a new study has shown. Homeless charity Shelter said more than 268,000 people across England are homeless, although the number is a "conservative estimate", with many more expected to be going unrecorded. It said the leading cause was the loss of a private tenancy, with three in 10 cases coming as a result.The government said it was "determined to tackle all forms of homelessness".Shelter has launched an urgent appeal to raise money for front-line services. The number of temporary accommodation households has risen from 35,850 in 2011 to 54,280 at the start of 2017. Shelter believes at least 35% of those households will still be in unreliable homes in a year's time, showing little end in sight for many. This is partly down to the number of people losing private tenancies, which the charity says has soared since cuts to housing benefits started in 2011.Polly Neate, chief executive of Shelter, is calling for an "ambitious new direction" from the government to tackle the issue, saying: "On a daily basis, we speak to hundreds of people and families who are desperately trying to escape the devastating trap of homelessness. "[It is] a trap that is tightening thanks to decades of failure to build enough affordable homes and the impact of welfare cuts." Victoria says she just wants "a safe place to call home"
At 72 years old, Victoria is homeless after her landlord decided to sell her privately-rented flat and she could not find anywhere to live. The pensioner from London - whose surname we have not used - said that, despite always paying her rent on time, landlords did not want to rent to someone on housing benefit, and many properties in the capital were too expensive for her. "Presenting myself as homeless was in itself humiliating and scary," she said. "You're left sitting around for hours, waiting to find out if you'll have a place to stay that night. "Victoria is now living in temporary accommodation, but is desperate to find somewhere permanent and "a safe place to call home". "The whole thing makes me feel like there is something wrong with me," she said. "I've moved around a lot, and yet for the first time in my life I feel like I have no control over my situation. "I'm not easily scared, but the fear is terrible - you just don't know where you are going to end up. I'm in a constant state of anxiety and stress." Homelessness has been rising rapidly since 2010, but it's difficult to know exactly how many people don't have anywhere to live. Estimates of rough sleepers are calculated by counting people on a single night, and potentially millions of "sofa surfers" go under the radar.The charity, Shelter, has pieced together various data sources to arrive at their figure.They used official data on how many households are living in temporary accommodation to calculate how many individual people that equates to. They looked at hostel bed occupancy to include people who turn up without being referred by the council, often paying a fee to stay, who don't appear in official figures. And they asked councils how many homeless families they were accommodating, giving a much higher figure than the 78,180 homeless households usually quoted. Reality Check: How many people are homeless in England?